The newest tutorial on Digi’s XBee Examples site teaches you to create a wireless force sensor or FSR. The force sensor sends out a signal that varies depending upon how hard you press on it. It can be used to measure weight or pressure. 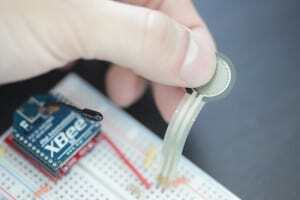 Additional examples for XBee radio sensors and outputs are being posted regularly, all summer long. Follow our RSS feed to collect ’em all. For example last week’s Digital Input example could be used to detect whether a cat is on a mat. But if you need to know how fat is that cat on the mat, then then Matt Richardson’s new Feeling Force example is for you! ‹ XBee Internet Gateway Released for Macintosh, Windows and Linux!